Tutorial contributed by Christian Parsons (http://www.camara-lucida.com.ar/tutorials/calibration). This tutorial explains how to calibrate a kinect and a projector. The goal of the calibration is to find the extrinsic and intrinsic parameters for both kinect and projector. This tutorial assumes you are using the libfreenect backend. It was tested on Ubuntu and OS X. You should get a yml file with its intrinsic parameters. See Calibration to do so. The chessboards you see on the corners of the board are printed chessboards. 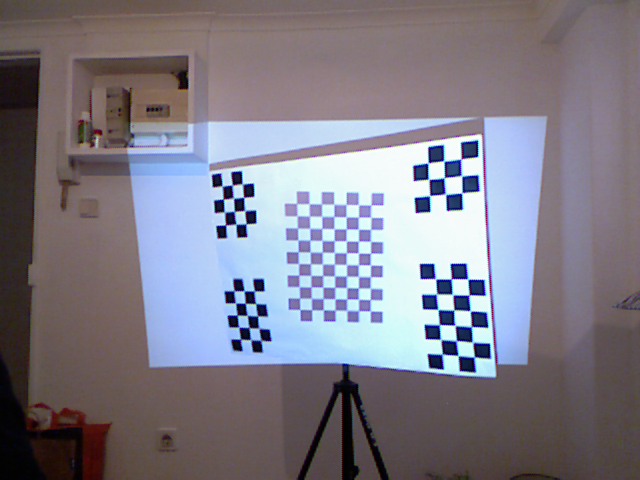 The empty space in the center is there to project another chessboard image with the projector. As explained in step #2. 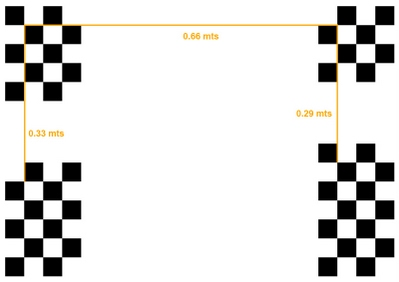 As you can see in the image above, you have to move the chessboard and grab images like a standard camera calibration. Don’t get too many images since calibration can fail. I usually grab between 20 and 30 poses. The kinect calibration file: —kinect, by default it will look for a kinect_calibration.yml file in the same directory. After calibration you will see in the console a line saying “Average pixel reprojection error” This number should be less than 1. If it’s greater than 1 it means the calibration failed for some reason. 6. You can now load the file in your software.